Last year, we had the pleasure of reviewing The Wand Company’s first foray into the Doctor Who market with their 11th Doctor Sonic Screwdriver Universal Remote Control (review here). It was only natural that after the huge success of the first product, that more would be on the way. 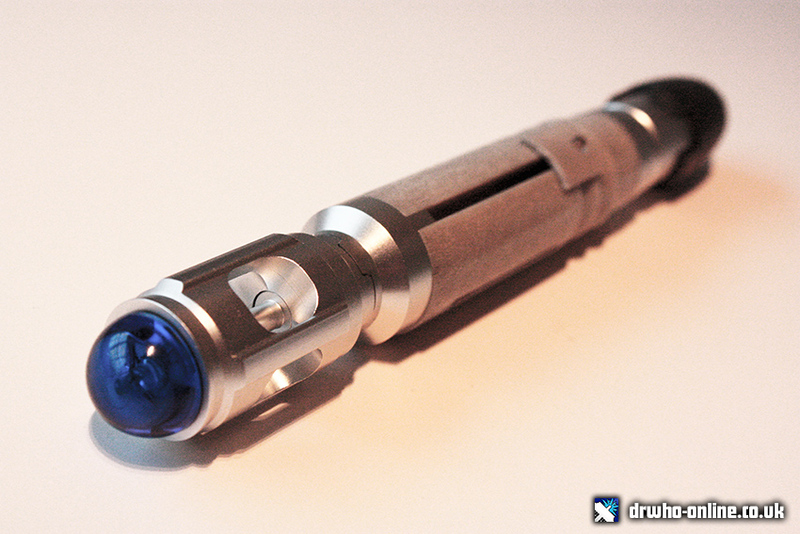 Enter the 10th Doctor Sonic Screwdriver Universal Remote Control… and what a product it is! Kicking off with the simple and clean white outer box, which ties in neatly with the 50th Anniversary branding, upon opening you are presented with a contrasting inner black box, which doubles neatly as a handy carrying case. 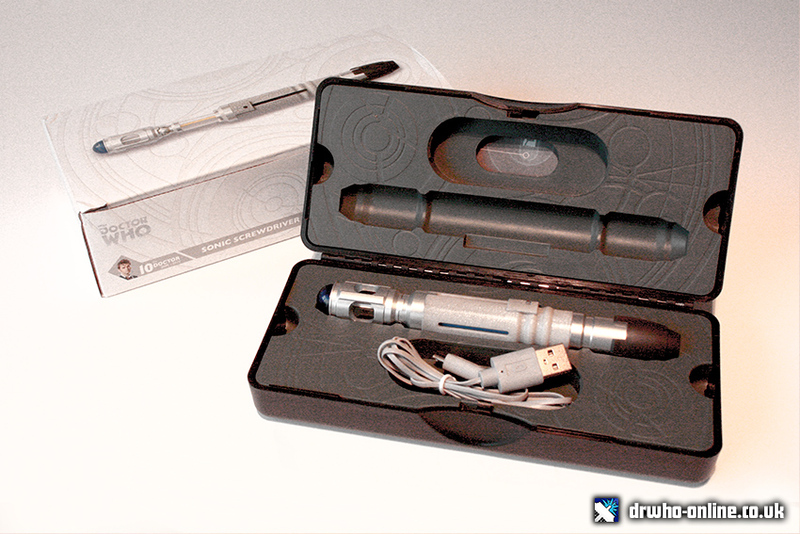 The case opens out to reveal the sonic screwdriver and a USB cable to charge the device, and getting started really is as easy as plugging it into to the nearest USB point on your computer. One charged, you’re ready to begin storing the remote control functions, of which there are 39 that the device can learn and store (13 gestures in each of the 3 memory banks). Programming the sonic to learn the gestures is incredibly easy, and nestled beneath one of the inner trays of the black carry case is a handy instruction manual which is simple to follow and will get you up and running in no time at all. 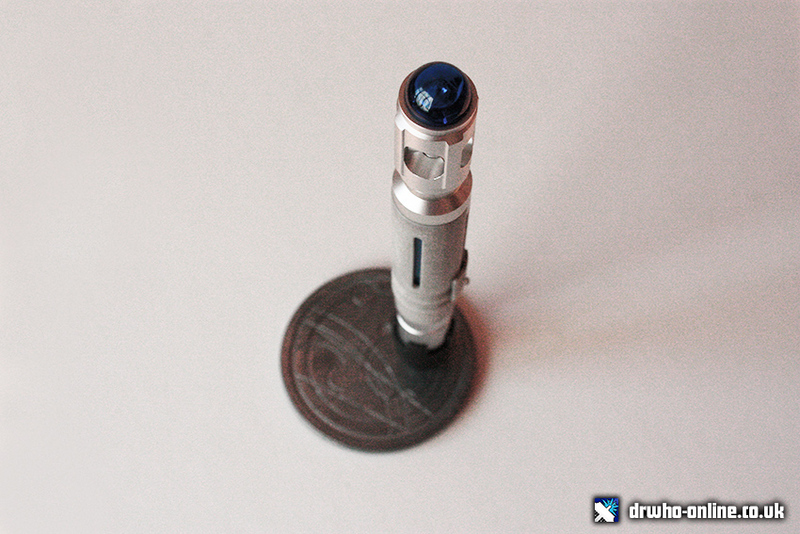 As with the 11th Doctor sonic, this is so much more than just a remote control. Instead of having the simple point and tap functionality, there are the added bonuses of light and sound FX, which help make the overall look and feel of the device even more real. In the instruction manual, it clearly points out that “The Sonic Screwdriver universal remote control is not a toy”, and they’re right; this is a loyal replica that just so happens to have the bonus of remote control features. The device is heavy enough for you to feel the quality, but light enough to perform all your remote control duties without feeling any burden of weight. Quiet Control Mode - Instead of the bells and whistles with the sound FX on the standard control mode, quiet control mode simply performs clicks and light flashes instead of the sounds. Practise Mode - This is for the user to learn how to perform the movement gestures correctly before going into control mode to store them into the memory banks. Finally, there’s the ‘FX Mode’ (our personal favourite). Even though, as we previously mentioned, this is not a toy (*smiles cheekily*), FX mode effectively allows you to be The Doctor, and sample up to ten different sonic screwdriver sound effects. If you quickly press the main button three times whilst in FX mode, there’s a great ‘Morse code’ feature that transmits up to ten different well known 10th Doctor phrases in Morse code. There’s one final surprise in this neat little package though, for when you lift up the other tray in the black carry case, there is, what could easily be mistaken as a Hobbit-sized metal coaster, bearing some Gallifreyan symbols. But this isn’t for your Venusian espresso - it’s a rather cool stand for your sonic, with a magnetic point for which to display the remote in a dazzling, timey-wimey, vertical position. Sure it may not be a necessary extra, but its another example of the attention to detail and extra mile that The Wand Company have gone to in bringing to life this iconic Doctor Who device. At £69.99, The Tenth Doctor’s Sonic Screwdriver universal remote control is almost £10 more expensive than the previous Eleventh Doctor’s sonic, but it is worth every penny. We actually preferred this more compact version of the sonic, and despite the size reduction compared to its televisual successor, there’s no compromise in the features or functionality it holds. + Click Here to buy now from FireBox for £69.95! Twelfth Doctor’s Sonic Screwdriver Remote Control By The Wand CompanyThe Twelfth Doctor’s Sonic Screwdriver Remote Control is finally here to give Doctor Who fans what t...Review: Sonic Screwdriver Universal Remote ControlThe Sonic Screwdriver Universal Remote by The Wand Company. Review for Doctor Who Online.REVIEW: The Twelfth Doctor's Second Sonic Screwdriver - [Toy]Doctor Who Online reviews the new Twelfth Doctor's Second Sonic Screwdriver, from Character Options.